I have had a fascination with miniature replicas for as long as I can remember. From playing with the original Lesney Matchbox cars to building 1/25 scale models vehicles during my adolescence, the more realistic the detail the better. While I have never been a huge HO (1/87) train enthusiast, I did pick up a few pieces in my early adulthood. This Santa Fe locomotive was the largest (and most expensive) of my small collection. Coincidentally, I now live in a town in which the BNSF has a switching yard. The merger of Burlington Northern and Santa Fe in 1995 created the largest rail network in North America at that time.Creston’s Restored Depot no longer handles passenger/freight rail service, but it is the home of city offices and the site of the Creston Model Railroader’s impressive HO train layout. While the Depot was closed today, I did manage to get a picture through the window. They have done a great job of replicating our community and signature events. 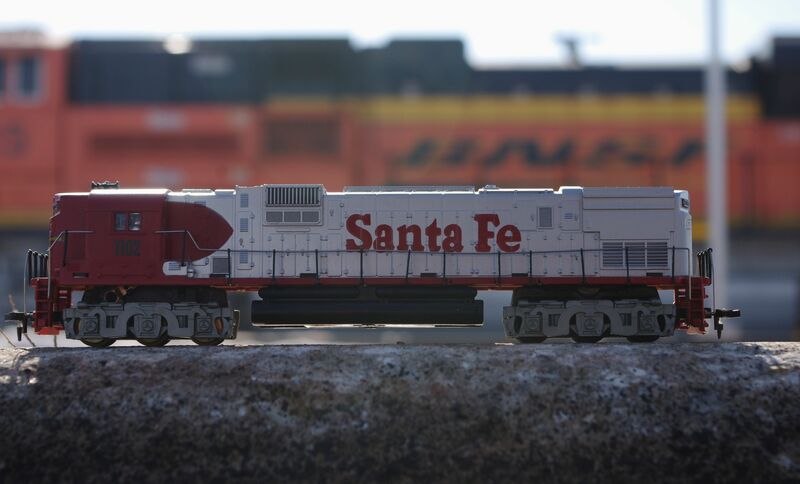 This entry was posted in Photography and tagged BNSF, Burlington Northern, Creston Depot, Creston Model Railroaders, HO train, Santa Fe, Weekly Photo Challenge: Scale by Chuck Spindler. Bookmark the permalink. I never understood the difference between OO and HO gauge, but you take me back to my youth – I was a Hornby Dublo boy! I am still in awe of the detail that these people put into their scale models. Thanks for the memories. Apparently, there is no difference in track width but the models sizes differ: HO= 1/87; OO 1/76. I have Tyco products which are all plastic (Hornby Dublo were diecast metal?). The model railroading today is a rich man’s or a poor men’s collaborative hobby with the elaborate layouts. The local club has mounted wireless cameras to give front and side views of the moving trains. Thanks for stopping by, Ken. This is a pretty cool idea of a picture for Scale. Works great! Thanks…as did your Lego Shakespeare (men and their toys). This is a cool photo. I spent my childhood and young adult hood in Iowa and still have a lot of family there. I’ve had to drive a family member to Creston to catch Amtrak. It’s an impressive depot. Thanks for stopping by. While we are transplants from Tennessee, we have enjoyed our twenty years in Iowa. Nice to connect with those who know the area.